In order to make a good decision on what is required of our binoculars, we need to know what to expect. If you were to ask me about binoculars for Safaris, or good general bird watching binoculars, I would have no hesitation in offering some advice because I have spent a lot of time in those environments observing birds and wildlife. So to get around this and to at least get a feel of what we can expect, I have done quite a bit of research and watched many videos on sights like You Tube taken by amateurs watching whales and puffins in Iceland. I chose amateurs because they are less lightly to have spent months on private boats with very expensive and very powerful video cameras and other equipment in order to take the incredible close up shots like you see in the National Geographic, but rather I wanted to see what it is really like and what the ordinary person on holiday is likely to experience. I am also using Iceland in this example as I am answering a specific question from a reader, but I would suggest that seal, whale and indeed puffin watching would be fairly similar in many locations, so much of this should still be relevant in different areas. 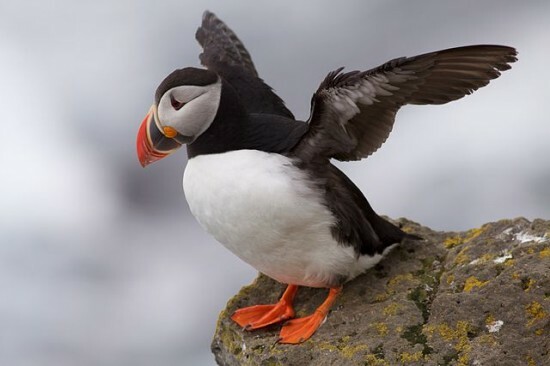 Home to one of the world's largest colonies of puffins and over half of the worlds population of breeding Atlantic Puffins, it is no wonder that many people visit Iceland just to see this magical bird. Because of this there are many specifically designed Puffin Watching tours, many operate from boats. In Iceland, they will take you to places like the two small islands of Lundey and Akurey which are well known for their colorful bird-life, inhabited by thousands of puffins and located in the Reykjavik bay area, only 15 minutes away from Reykjavík's Old harbour. The smaller boats are especially designed to take you as close to the islands as possible where they then turn off the engine allowing you to observe the birds and the beautiful surroundings. Whilst many people will specifically want to see the Atlantic Puffin, there are actually many other species of birds worth keeping an eye out for, these include the Fulmar, which is very much like a gull, the Great black-backed gull, the Lesser Black-backed Gull, the Arctic tern, the Eider, the Guillemot, the Arctic skua, the Gannet, the Kittiwake and the Shag to name a few. You can spot a large variety of whales in Iceland, although some just travel through and are only seen occasionally. But most of the whales spend the entire summer in Icelandic waters as it offers them with very good feeding grounds. The high productivity of the North Atlantic and the structure of the coastal areas offer a variety of habitats, suitable for many species with different requirements. Species you may expect to see include the Humpback Whale, Minke Whale, Orca (Killer Whale), Fin Whale, Blue Whale, Sperm Whale, Pilot Whale as well as the Harbor Porpoise and the White-Beaked Dolphin. 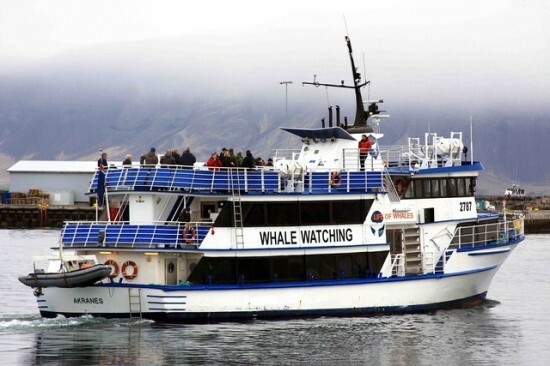 Most whale watching tours operate from a marine vessel which have been designed or modified for whale watching giving you a variety of locations both inside (for bad weather) and outside to get the best possible view. As you can see, unless you happen to be very lucky, the distances involved will be medium to fairly large and most sightings will be fairly short. But luckily a whale tends to be pretty large and even though as in the video the weather and light conditions look far from optimal, the whale stands out quite well from the surroundings making it easier to quickly locate through binoculars. The amount of light that a binocular can collect is largely determined by the size of the objective lenses and so whilst we want the binoculars to be compact to make packing them and carrying them on holiday easy, we also want them to have objective lenses large enough to ensure that they can collect as much light as possible to ensure that they have the ability to perform well even in poor light conditions. Compact binoculars with really small objectives of around 28mm are ideal to take travelling and would work fine in medium to good lighting conditions. But I think that in poor light the quality and brightness of the image would be a little lacking. If you have traveled all this way to see the brilliance of orange bill on the Puffin, I would want to make sure that my optics were not letting me down and so for that reason I would go for a larger binocular. Medium sized binoculars with 32mm objective lenses may be an option, especially if you also plan to use them on hikes or when walking. All else being equal, these will perform better in low light than compacts, but not quite as well as full sized binoculars. At the same magnification, full size binoculars tend to have a wider field of view than smaller binoculars and as you will see below this is important. With all other aspects being equal, the larger the objective lens, the better the resolution in the image. How much resolution you need depends on how much you're going to magnify an image. For magnifications of 8x or 10x, a 42mm objective lens provides plenty of resolution and there is no need to exceed your eyes' ability to see. The reason some people might choose larger objectives would not be for increased resolution but for more brightness in poor light and bad light or for use at night for astronomy. As long as they are well balanced a larger heavier pair of optics will resist moving better, so are often easier to hold steady, which can be a consideration if you are using a higher magnifications and when you are using optics on an unsteady platform like a boat. They are also far easier to use and more comfortable to hold than tiny compact binoculars, especially true if you are using thick gloves in cold or wet conditions, which you may experience when whale or puffin watching. So unless you really need make sure your equipment is as small and lightweight as possible, a full sized binocular is the best option in terms of image quality and brightness and for me is the best option for whale, seal and puffin watching. 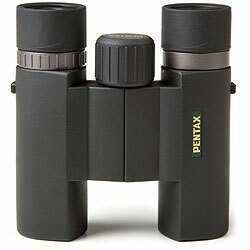 If you do decide to go for a full sized binocular, it does however still make sense to choose a pair that is small and lightweight when compared to others in their size class as some of the smallest, lightest ones really don't feel that much bigger than many mid-sized binoculars and yet you get all the benefits of having much larger objective lenses. One last point - Whatever objective lens size you do opt for, In this instance I would probably choose a roof prism binocular as opposed to a porro prism one, as they tend to have a slimmer profile and can often fold away to a much more compact package when not in use. In optics almost everything is a compromise and this is definitely the case when it comes to the field of view and the magnification on a pair of binoculars. What you need to do is find the right balance to suit your needs. A really powerful magnification will get you nice and close to your whale or puffin and offer you plenty of detail, but you will be left with a smaller field of view (FOV) making it harder to locate them. This is why most most good general use bird watching binoculars tend to keep the magnification to about 8x, although in some circumstance, like in wide open areas by the sea, it is preferable to use something more powerful - see my article on 10x42 Binoculars for Bird Watching for more details. As well as a reduced FOV, any movement you make is magnified that much more with higher powered binoculars and so if you are on a boat, a really powerful magnification could be almost impossible to keep steady. This is why most Marine binoculars tend to have magnification of only 7x. So whilst we want a powerful magnification, we need to balance this with our need for a reasonably wide field of view and image steadiness. My preference would be for an 8x or to look for 10x binoculars with relatively wide fields of view. If image steadiness is a real concern, you could look at getting binoculars with image stabilization, like the excellent range of Canon Stabilized Binoculars, however most of these are not fully waterproof. Another very important aspect to consider when deciding on the size of objective lens and the magnification of your binoculars, especially if you will be using them in poor and low light conditions is the size of the exit pupil. The exit pupil is basically the width of the column of light exiting the eyepiece of your binoculars. If it is narrower than your eyes pupil, you will perceive the image that you are looking at through the binoculars as being dark and so in low light, when the pupils of your eyes are large, it is really important that your binoculars have a large exit pupil. The size of the exit pupil is determined by the size of the objective lens and the magnification of your binoculars and is calculated by taking the diameter of the objective lens and dividing it by the Magnification. 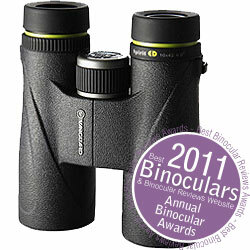 For example an 10x42 Binocular has a 4.2mm diameter exit pupil, whilst a 10x32 Binocular has an exit pupil of 3.2mm. So as you can see low powered binoculars with large objective lenses have large exit pupils and high powered binoculars with small objectives have small exit pupils. This is definitely one of the reasons why, especially for uses where you cannot be sure of good light or you are going to be using your binoculars around sunset I would choose binoculars with larger objective lenses as long as weight and compactness we not critical. For more on this please read my Complete Guide to the Exit Pupil. Whatever magnification and size of objective lens you do decide to use, you want to make sure that as much of the light that enters the binoculars get to your eyes. We have already spoken about the size of Exit pupil which can be roughly worked out, but this equation assumes that there is perfect transmission. In the real world, not all of the light that enters the system gets to your eyes and some is lost through absorption and reflection at each air-to-glass surface or inside the prism system itself. The amount of original light available that gets to your eyes depends on a number of factors including the quality of the optical elements and their coatings which can make a substantial difference that directly effects the actual brightness of the observed image. Good coatings on the lenses and the prisms can in some cases double the amount of light that gets through the binocular, when compared to those that have none or poor quality coatings. Indeed I have tested binoculars with smaller objective lenses, but good quality lenses, prisms and coatings, produce a higher quality and brighter image than ones with larger objectives but lower quality glass and coatings. These days you don't need to spend a fortune making sure that the glass and their coatings are of a high standard. Lens Coatings - Make sure your binoculars come with fully multi-coated lenses, which means that the lenses have received multiple layers of anti-reflective coatings on all air-to-glass surfaces which is what you want to see. 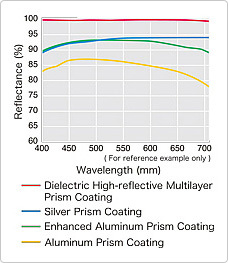 Just be aware as some manufacturers describe their lower quality optics as being Multi-Coated which only have multiple anti-reflection coatings added to the outer surfaces of the lenses. Worse still are optics that only have a single layer of anti-reflection coating added to the outer lenses (Coated). The worst are ones that have no anti-reflective coatings at all and I highly recommend staying well clear of these. The Prisms and their Coatings - Make sure that the prism is made from BaK-4 glass, and not the far cheaper and inferior BK-7 glass found on cheap binoculars. If you are opting for the roof prism design, try and make sure that they have phase correction coatings onto the prism that keep the light in the correct color phases and therefore produce images that have better contrast, a higher resolution and improved color reproduction. Also take note to see if the manufacturer advertises what, or indeed if there are any highly reflective coatings on the prisms. The one downside to the roof prism design is that the first prism in the system has one surface that does not feature total internal reflection, this results in the loss of some light. It is therefore very important for a binoculars' optical performance to raise the reflectivity of this surface. To do this, better quality binoculars have single or even multi-layer coatings on the surface of the prism to raise it's reflectivity. The least expensive way of doing this is to use an aluminum mirror coating, which has a fairly high reflectivity of between 87% to 93%. If a Silver mirror coating is used you can get a much higher reflectivity of 95% to 98%. 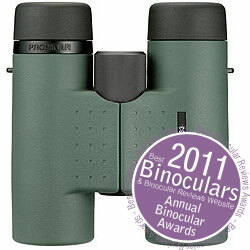 High end binoculars sometimes use a dielectric coating rather than a metallic mirror coating. This causes the prism surface to act as a dielectric mirror that can provide a reflectivity of more than 99% across the visible light spectrum. As you will be at sea where even in fine weather there is the possibility of sea spray, I would highly recommend making sure that the binoculars you choose are fully water and fog proof. This should not be a problem as these days most good quality optics are fully sealed and therefor waterproof, but just check to make sure. The amount of eye-relief the binocular has will be very important to those who use glasses and want to keep them on whilst using their binoculars. Eye Relief is basically the distance from the ocular lenses or the last surface of an eyepiece at which the eye can obtain the full field of view. Eyecups on the binoculars ensure that your eyes will be at the correct distance for this to happen, but if you wear glasses, you can't get your eyes as close to the lenses as those without glasses, so you need to adjust the eyecups to ensure that even with your glasses on your eyes are the correct distance from the ocular lenses. Binoculars with a longer eye relief are ideal for those who wear glasses as they basically project the image further beyond the ocular lens, giving you plenty of room to play with. So if you wear glasses, you should be looking for an eye relief of at least 15mm, to see the full image full image. The down side to long eye relief is that it usually reduces the field of view. How much you should spend on your optics will largely be down to your circumstances, how often you plan to use them and just how highly you rate the importance of quality versus price. But if you were to take any advice from this page or indeed this website, then please don't opt for the cheapest binoculars out there. Very cheap binoculars are often no better than toys and in some cases you can actually get children's binoculars that will perform better! The worst binoculars will also most probably put you off using them, not last very long and the poor quality image will in some cases mean that you will be better off not using them at all. However I am not suggesting that you have to spend a fortune on your optics either. Whilst it is true that the very best binoculars are also quite often some of the most expensive, there are also some really very good pairs of out there these days that won't cost you much more than the cost of the whale or puffin watching tour, yet you can use them for many years to come, safe in the knowledge that the view you get through them is of a very high quality. To give you an idea, take a look at some of the Best Value For Money Binoculars that I have reviewed in different price categories, or take a look at my winner for the overall Best Value For Money Binocular Award. Based on all that we have discussed above and on binoculars that I have actually used and reviewed, I have listed a few of my recommendations for the best Binoculars for Whale, Seal & Puffin Watching. The are split into different price categories and so I hope you can find one that matches your budget.